A successful Moonwatch tonight. Coordinated by Richard, there were 4 scopes and several EAS members present. 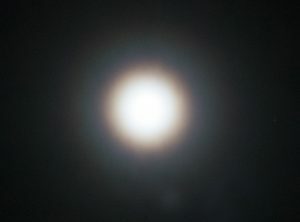 The Moon was covered by high haze and a nice halo round it but it was clear though the scopes although lacking some contrast. Virtually no stars were visible! The 110km diameter crater Gassendi was showing really well. Initially very quiet but very busy at times later on. A quick telephoto shot at the end of the event. 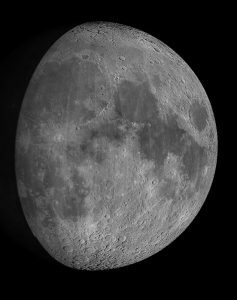 We have a moonwatch next Saturday, January 27th from 1830 – 2100, where anyone passing can view the Moon through our telescopes, weather permitting. The Kendal Brewery Arts Centre garden gives good view southwards and has coffee and toilets as well! Let’s hope for some good cloud-free skies. The Moon should look a bit like this. Active from December 6-17, but with a slow rise to maximum on 14 December. The Geminids are currently the richest of the regular annual meteor showers, producing an abundance of bright meteors at the maximum. Timing this year is good as the maximum occurs just before new Moon, so no interference by moonlight, enabling many fainter meteors to be seen in addition to the brightest members of the shower. Peak activity expected at about 02h on Thursday, December 14. In recent years, from the UK, the Geminids have shown typical peak observed rates of 70-80 meteors per hour in good skies if clear, so we might expect something like this on the peak night of December 13/14 (Wednesday night/Thursday morning). However, the maximum is quite broad and respectable Geminid rates may be expected throughout the nights of December 12/13, 13/14 and 14/15. Past observations have shown that bright Geminids become more numerous some hours after the rates have peaked, a consequence of particle-sorting in the meteoroid stream. Geminid meteors enter the atmosphere at a relatively slow 35 kilometres per second, and tend to last longer than most in luminous flight and may fragment into a train of ‘blobs. The Geminid shower radiant (at RA 07h 33m, Dec +32°, just north of the first magnitude star Castor in Gemini) rises early in the evening and reaches a respectable elevation above the horizon (> 40°) well before midnight, so observers who are unable to stay up late can still see a good show if clear. However, the early morning hours of Thursday, 14th December are likely to see the greatest Geminid activity, when the radiant is high in the sky. Where best to look: As with any meteor shower, when observing it is best to look at an altitude of 50° and 40-50° to either side of shower radiant, rather than looking directly at the radiant itself, although Geminid meteors may appear in any part of the sky. It could be quite cold so wrap up well with plenty of layers of warm, dry clothing and make sure that you wear a hat, gloves and thick socks if you are outside for any time. No equipment is required – just go and look! 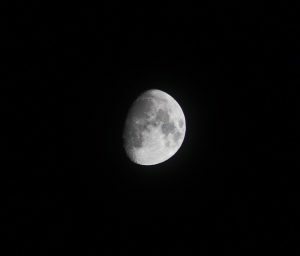 There was a successful EAS moonwatch last night at the Brewery Arts Centre despite the odd cloud obscuring the view. Lots of ‘Oh’, ‘wow’ and ‘cool’ from the passers-by as they clearly saw the craters on the Moon, many for the first time, through Society members telescopes. Lots of different ages… very young to, shall we say, senior citizens. There were pulses of visitors coinciding with the start and end of various Brewery events, so quite busy at times. Friends of the Lake District are hosting a FREE Dark Sky event at Mazonwath near Orton, this Saturday (11th November) at 1830. 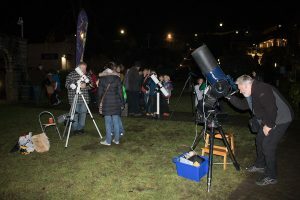 See https://www.friendsofthelakedistrict.org.uk/Event/dark-skies-star-gazing for more details. We have the “Telescope Night” meeting on Monday. Anyone with a (portable) telescope, please bring it along to the meeting. The second half of the meeting will be a chance for members to see all the different types, and discuss their merits and drawbacks with the proud/frustrated owners. Don’t be shy if your telescope is of the cheap and cheerful variety – people thinking of buying a first telescope will be thinking of getting one like yours, and be keen to see what is available. Complicated ones are also welcome if you can get them down the stairs. Hope to see you all there on Monday! 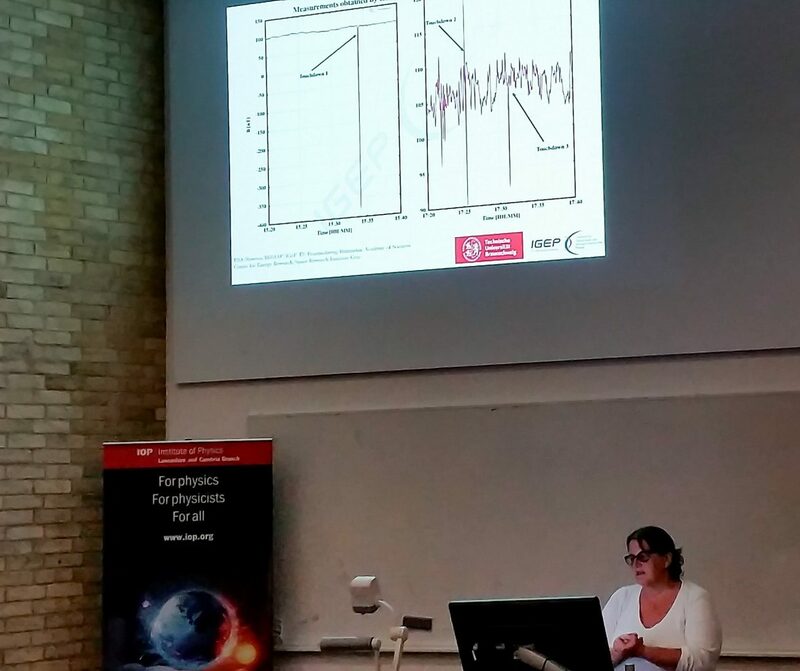 Following the excellent meeting last Monday with the talk on Women Astronomers by Martin Lunn, the Institute of Physics magazine has just published an article on Professor Jocelyn Bell Burnell. She was recently awarded the IoP’s President’s Medal for her outstandish work in physics, much of which recently has been on encouraging women to go into science. Of course, she is [sadly] known as the women who didn’t get a [deserved] Nobel Prize for the discovery of pulsars [and I don’t think they do retrospective awards]. But she has many other strings to her bow, so I hope you will enjoy the read and learn at bit more about her. Members might be interested in this article, from the Institute of Physics magazine physicsworld, on Cassini. The mission will end next Friday [15th September] when Cassini dives into Saturn’s atmosphere to avoid possible future contamination of Saturn’s moons. 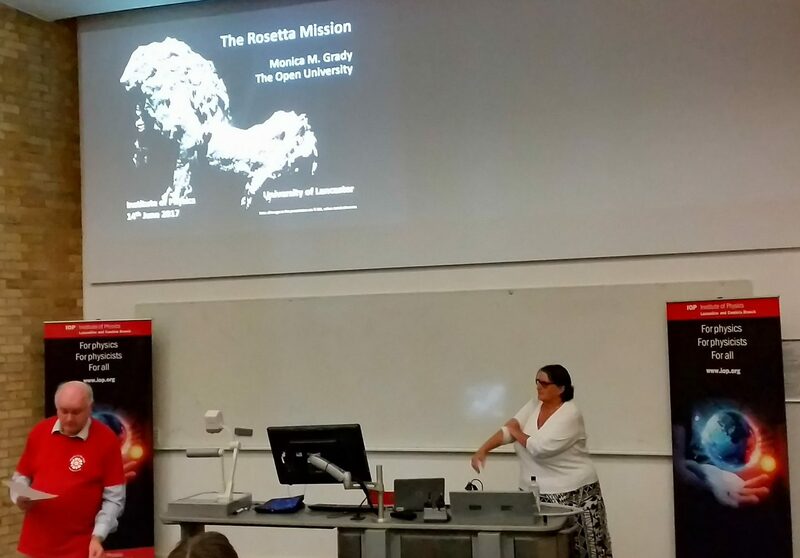 Eleven EAS members travelled to Lancaster to hear Prof Monica Grady speak on the Rosetta mission. It was an entertaining presentation giving some insight into the difficulties, complexities and timescales of such a mission. We were told why the orbiter and lander were called Rosetta and Philae – it is linked to the famous Rosetta Stone in the British Museum and how this led to the deciphering of Egyptian hieroglyphics. The hope was that this mission would ‘decipher’ some of the secrets of the early Solar System. The instruments, built with late 1990’s technology, were delivered for integration onto the spacecraft in early 2001 and subsequent launch in 2004. The spacecraft flew by several asteroids before hiberbnating for 4 years prior to the encounter with Comet 67P/Churyumov–Gerasimenko (67P)… it did wake on command to much relief and well, the rest we know… The science analysis will go on for several more years. At the end, there was a lively Q&A with several EAS members asking questions.